The story behind the name: Boötes is said to be one of the most ancient constellations in the sky. There is no single definitive myth associated with this constellation, but it seems to have impressed early civilizations with its resemblance to a human torso (a kite-like shape, sometimes with legs or a raised arm). The most ancient associations from the area of the eastern Mediterranean and Middle East are that of herdsman, cart driver, and plowman. In Greek literature, the name Boötes (thought to be derived from ox-driver or herder) is mentioned in Homer's Odyssey in a long and complicated multi-generational story of intrigue. The story starts with newborn twins, whose father was Poseidon, who were abandoned on Mt. Pelion to die and later rescued and raised by a herdsman. One of the twins was named Boeotus and went on to be reclaimed by his maternal grandfather and to inherit part of his kingdom. An Egyptian legend saw Boötes as a guardian goddess in the form of a Hippopotamus who kept the evil pole stars under control. An Arab legend saw the same pole stars as a flock of sheep herded by Boötes. A different interpretation, also loosely from Greek legend, saw Ursa Major as a plow, and saw the human figure in Boötes as the person who first taught plowing and agriculture to humans. In that story, the knowledge of agriculture is given to humans by Demeter through a herder named Triptolemus. Demeter rewards him for identifying Hades as the kidnapper of her daughter Core (also known as Persephone). The Romans saw the stars of Ursa Major as both the Triones, a mythical group of oxen, and a plow, and saw the figure in Boötes as the ox driver and ploughman. 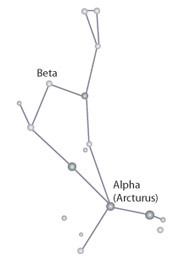 Other Greek legends regard the figure in Boötes as a keeper or driver or chaser of bears, represented by the constellations Ursa Major and Ursa Minor. The most prominent star in Boötes is the 4th brightest star in the sky, an orange-yellow giant known as Arcturus, which means "guardian of the bears". 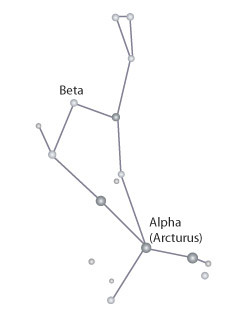 Arcturus was an alternate name of this constellation. It is not clear which came first, seeing Ursa Major and Minor as bears, or the idea of the star Arcturus as a guardian of bears. In any case, versions of the legend of Callisto and her son Arcas, one or both of whom were transformed into bears and placed in the sky by Zeus, are associated with Boötes. Later, in the 17th Century, the astronomer Hevelius created two bear-hunting dogs for Boötes with the constellation Canes Venatici. In a completely different interpretation, ancient Chinese astronomers also placed significance on Arcturus. They saw the star as one of the horns of a giant dragon in a large constellation that stretched from Boötes to the constellation Virgo. The full moon appearing near Arcturus was a sign of the new Chinese year.